[Police] said the teens [19 and 17] grew up in the same Northland trailer park and had visited the zoo several times recently. According to court records, the teens decided to pull off the stunt Nov. 4. They brought a stroller, blankets and a makeshift cage to the zoo and visited the African section. 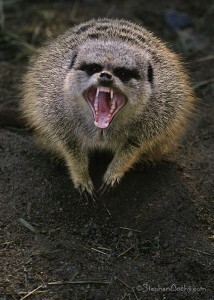 [Justin] Santhuff jumped over a 4-foot barrier into an open-air exhibit and took one of four male meerkats. [Jacob] Bradley allegedly pushed the stroller out of the zoo. As they drove away, Santhuff admired the meerkat and reached into the cage, police said. "Look at how cute he is!" Santhuff reportedly said. The meerkat then chomped its sharp teeth into his finger. The teens kept the meerkat in a glass aquarium topped with a wooden board….But each time they lifted the lid, a stench filled the room, a witness told police. The witness said the odor was worse than anyone could imagine. After about a week of this sort of thing, they decided they had had enough and dropped off the meerkat (in its cage) in front of a local pet store. Police returned the animal to the zoo. Santhuff and Bradley are also back in captivity. At least two people called police to tip them off as to the identity of the meerkat thieves; one reported that, in a move that now seems par for the course, Santhuff had been bragging about his crime on Facebook. He and his friend now face felony theft charges. According to Wikipedia, "[m]eerkats make very poor pets."